I can’t believe December is finally here! With Christmas (& 2019!) right around the corner, I wanted to share a fun sparkling holiday look I created with Clarins’ limited edition Shine & Shimmer collection. It includes a lip comfort oil in “09 red berry glam,” a gold mascara top coat, and an illuminating sculpting powder. This dazzling trio delivers the perfect dusting of glitter for your cheeks, eyes, and lips this holiday season! For some years now, I’ve been a fan of Clarins’ lip comfort oil because it gives just the right amount of shine without drying my lips. The one in this limited edition collection is a sheer red tint with subtle gold shimmer – the perfect formula for an irresistible kiss under the mistletoe! 😉 It is super versatile – I’ve even worn it to the gym before to keep my lips hydrated in the mornings. For an extra boost of red or pink, I occasionally like to switch it up with my favorite lip color underneath. Otherwise, it works wonderfully on its own as a lip gloss. Unlike other lip glosses, this one isn’t overly sticky, which is a big plus in my book. While I love using different eye shadow colors and lippies depending on the occasion, this was my first time experimenting with gold mascara! Since I don’t like wearing fake lashes, I definitely apply several coats of mascara to bring out volume and length in my natural lashes. This holiday, I’m dressing up the tips with Clarins’ gold mascara top coat. Coupled with my everyday mascara, I love how this top coat gives my eyes that extra gold sparkle. A quality highlighter is a necessity for me as it makes such a difference in my makeup routine. I have been using Clarins’ Illuminating Sculpting Powder to accentuate my cheekbones, nose bridge, brow bone areas, and décolleté. The extra shimmer really makes my face more feminine & defined. 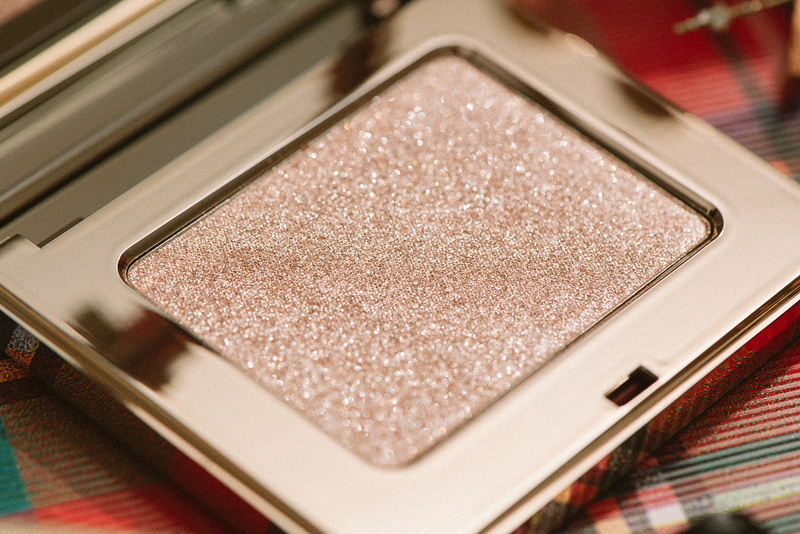 I am pleasantly surprised at how pigmented this Clarins highlighter is; it sits well on the skin and keeps me glowing from day to night, as I bounce from one holiday gathering to the next! 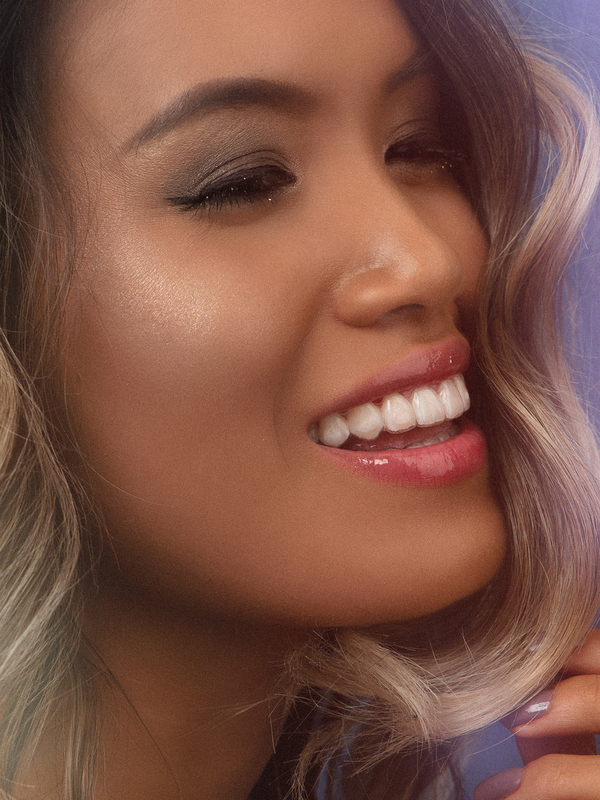 Have you experimented with a fun sparkling makeup look this holiday season yet? Next My Updated Self-Tanning Routine & Products I Love! These products seem great! I love Clarins. I need some new sparkly makeup for Christmas so I may just have to buy these. Oh, I love Clarins! I have to try this! Glad to hear you’re a fan too! I think you’ll really love this collection. Thanks so much, Lindsay! I appreciate it! WOW, amazing! Love these pictures and that gold mascara looks so cool! Thanks Carolyn! I think it’s rad too! Great way to add a touch of sparkle to an everyday look, without going overboard. Oohhh what a fun and festive look for the holidays. I’ll have to try recreating this with these Clarins products 😍 Thanks did sharing. Nice make ups. Beautiful shades. I will definitely try this new products. Been a fan of Clarins for years. Love it. Thanks Diana! I’m glad to hear you’ve also been a fan of Clarins for years. They truly do make some of the greatest makeup products. The highlighter in this set is one of my faves! This is such a gorgeous look babe, I love that lip color! I have heard a lot about Clarins lip comfort oil. I always wanted to try this and been looking for this one for the past 2 weeks. This looks and sounds great. I am more concerned with my lips now that I used to be. So important to have this lip comfort oil. I am with you! Living in the desert, my lips are always dry if I don’t take good care of them. The lip comfort oil makes it so easy for me! I love it! Your makeup looks so good here! I think I need all these products! I LOVE Clarins products! Your makeup is gorgeous! Absolutley loved this! Love the shimmer of the holiday hues on my face! Oh Clarins has sparkly makeup?! I love the look, it’s the perfect holiday glam! Thanks darling! I love how versatile it is. Even though it’s a bit tinted red with gold glitter, it’s wearable everyday! I don’t have that much shimmery / sparkly make-up but this lip shimmer looks so amazing! I need to try this! Perfect for all the those holiday parties! It is amazing! Shimmer is a must for holiday parties this year. Oh my girl you are absolutely gorgeous and your makeup looks amazing! These products are awesome! I love these holiday looks! I haven’t tried Clarins makeup before but that highlighter and that lip oil looks amazing. And how fun is that gold mascara? So fun and festive! You seriously look gorgeous and I need to add some of these items to my wish list for the holidays! I cannot get over your magnificent look 🙂 it’s perfect for holidays! 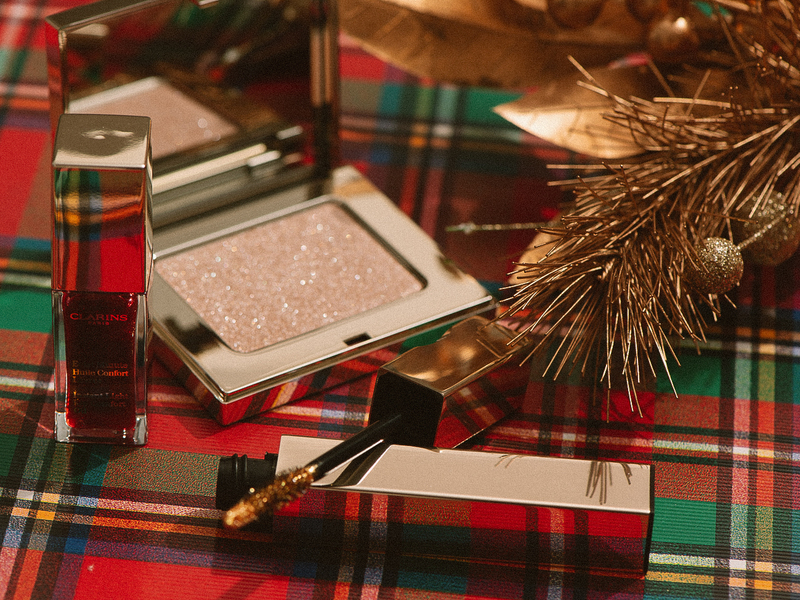 All of these glossy and shimmery items are perfect for creating pretty holiday looks!! They look even better when you applied them! I’m so interested in the gold mascara- never seen anything like it! Thank you Samantha! You’re so sweet. 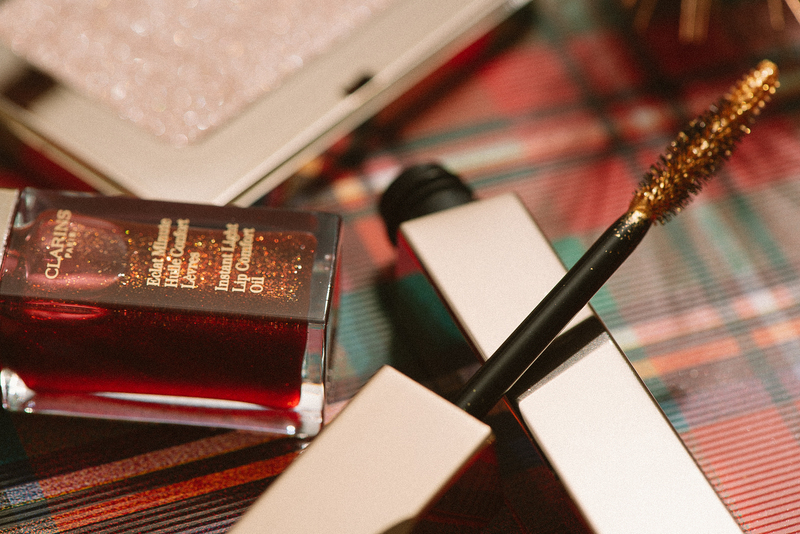 You’d rock the gold mascara too. It’s new to me too! Your skin is amazing! I love that lip color too! I love this look! The gold mascara adds an extra edge and definitely brings out your natural lashes. I’m not a fan of false lashes either, so I might have to give this one a try. Thank you for sharing, Sharon! OMG what a beaut look! I’ve never tried Clairns but have always wanted too. You’ve inspired me. I have a Sephora coupon so I’ll go tomorrow. You should definitely try! I especially recommend the lip comfort oil (I have several it in different shades), and this highlighter is great too. Wow..what a fabulous looking! I would like to try Clarins. Thanks for sharing. I think this is a perfect look! I am definitely up to try this. You look so pretty! Girl, that highlighter looks amazing!! Such a pretty holiday look! Omg I’m OBSESSED!!! These sparkles are everythingggg. You look so stunning! I am such a fan of Clarins! I love your make up here hun, you look beautiful!! So happy to hear you’re a fan too! Thank you Jessi! You look gorgeous as always hehe. Still waiting for one day to get glammed up by you!!!!! I’m such a huge fan of this brand, and this looks like another must-try for me. Thanks for sharing dear! Your skin and make up looks amazing. I have used Clarins skin care products but never their make up surprisingly. 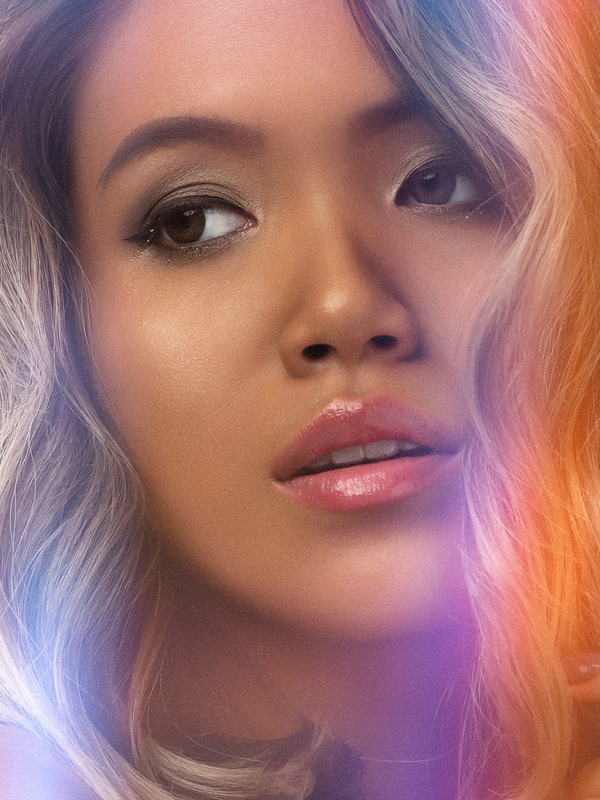 Love the glimmery eye shadow and lip gloss! Need to try it sometime! Happy holidays! 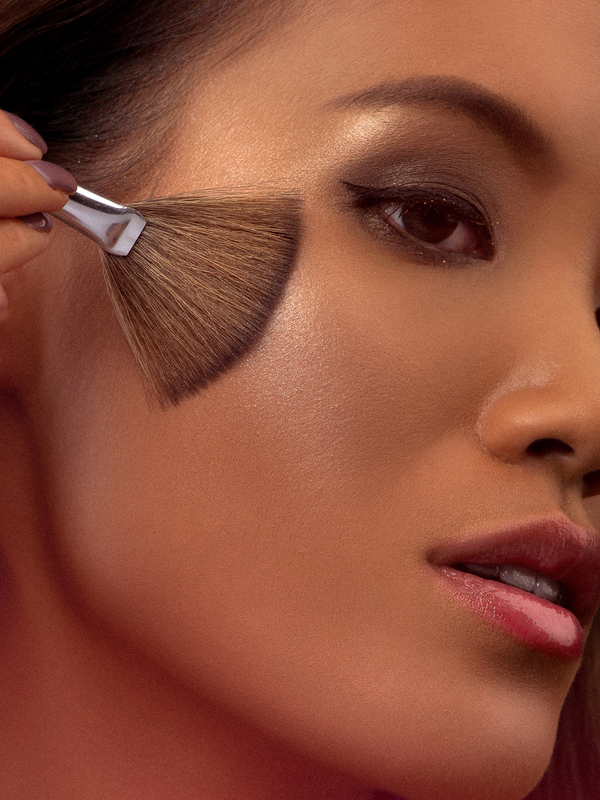 Awww I absolutely love your holiday makeup look with Clarins! It’s so neat that they’re coming out with makeup too as I’ve enjoyed using their skincare line. I use the lip oil from Clarins as well and love how nourishing and hydrating it feels on my lips!